Here’s a good place to start to learn how to pray with your mate. 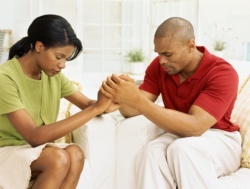 These eight suggestions will help you transform your marriage with prayer. who responded to our questionnaire. 1. Take the time needed to talk with each other about your thoughts and feelings about prayer and praying together. Do this without pressuring one another or trying to make the other feel guilty. See if you can agree that this is something you both want in your marriage. Talk about your fears in as open a way as possible. Talk also about your expectations up front, so they don’t undermine you later on. 2. Pick a specific time and make a commitment to each other to begin praying together at that time. You’ll never get started praying together on a regular basis if you don’t make this definite commitment to a specific, agreed-upon time. 3. Don’t be upset if you miss a day. It’s important, if you miss a day, to just start again the next day. Consistency will come over time. Let yourself off the hook here. 4. Decide who will do what. For example, who decides where you will pray together? Who reminds the other that it is time to pray together? Couples reported that they couldn’t just make a commitment to a time and then assume both of them would remember. It helped for one person to take on the responsibility to say, “Hey, it’s time for us to pray together.” It was interesting to note that for the couples who were successful, it was more often the husband who did the reminding. 5. Start where you are both comfortable. This means that if only one of you is comfortable praying out loud, then you don’t start there, for both aren’t comfortable at that place. If one of you insists that you pray together silently, then both can be comfortable at that place and that’s where you begin. 7. Agree at the beginning that neither one of you will preach in your praying. Nothing can stop the process like using the time to pray together as a way to preach to your spouse, or to make suggestions in your prayer. Sometimes just making this a rule will give a reluctant spouse the freedom to get started, for a common fear is that one’s spouse will use this time to preach rather than to pray.